Computrols began manufacturing its own line of DDC controllers in the early 1990s as a means of providing turn key solutions for our customers. Since that time, Computrols has focused on providing the most robust, intuitive, and innovative hardware solutions on the market. Whether you are controlling a chiller plant or a simple VAV system, Computrols has the product for you. Offering our own line of ddc controls has also enabled Computrols to further develop its integration solutions and support additional protocols used by other manufacturers such as Johnson Controls, Siemens, Automated Logic, Alerton, CSI I/NET, and many others. Computrols HVAC hardware has proven time and time again to be the toughest in the industry. These controllers can be found in healthcare facilities, college campuses, and commercial office buildings around the world. Computrols’ access control system is a deployable solution for facility managers in any industry from a commercial office to a multi-level bio hazard laboratory. Our hardware often enables our customers to leverage many of their current security investments by integrating to third party access control devices. Computrols access control solutions provide facilities with the reliability needed to mitigate security-related risks. CSimon is on the cutting-edge of fire detection. This powerful system is designed to protect the lives and property of building occupants by providing quick and accurate information in event of a fire. Like all Computrols hardware, CSimon integrates to a number of third party devices. The CSimon Fire Alarm System has the flexibility to address the needs of many different applications to ensure the safety of building occupants. 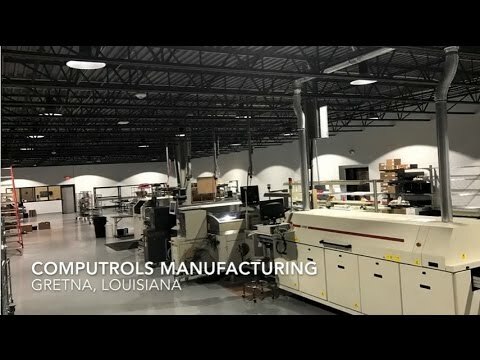 All products manufactured by Computrols are 100% designed, manufactured, and quality control tested at our corporate headquarters in New Orleans, Louisiana. By having all aspects of the manufacturing process conducted under a single roof, Computrols is proud to offer a product that is manufactured in the U.S.A and also offers the industry’s only lifetime warranty. No matter what kind of facility you manage, happy and healthy building occupants and energy savings are always among the top of your concerns. Have a look at our case studies to see how Computrols helped our customers create safe, comfortable, and energy efficient environments.